We are constantly looking out for space saving products that can help improve small flats, studio apartments and tiny kids' bedrooms. Our designers know the trick to making a wall mounted bed really efficient: which is for people to be able to use the space in front of it until they need to pull down the bed. A wall bed with sofa will work wonders in a small living room, combining everything one needs in one single piece of super smart furniture. A sofa by day, a bed by night, this solution can also come with a dining table incorporated instead of a couch. Simple, safe, easy to open and with a stylish customizable design. A single wall bed needs to deliver a stunning look, just because kids and children deserve it. What they also deserve and need is to make full use of their room, no matter how small it is. A murphy bed is a great solution when it comes to furnish a tiny bedroom, or simply adding a second bed for guests. Maximising space is key: your young ones love to stay in their rooms and spend time there with friends. A fold down bed has to combine brilliant design, a huge range of colours to personalise the space, and of course function. Complicated mechanisms are not allowed, all kids need to do is to pull down the fron panel to obtain a nice and comfy place to sleep. Need extra space? Go for a wall bunk bed and make it double. Home office or guest bedroom? A murphy bed with desk is the perfect solution if you find yourself facing this choice. A spare room is always a great thing to have, but furnishing can be a challenge when it comes to wanting a multi-purpose space. Guests, family, friends from abroad, kids' sleepovers. But also: computer, desk for homework, diy craft station and so on. 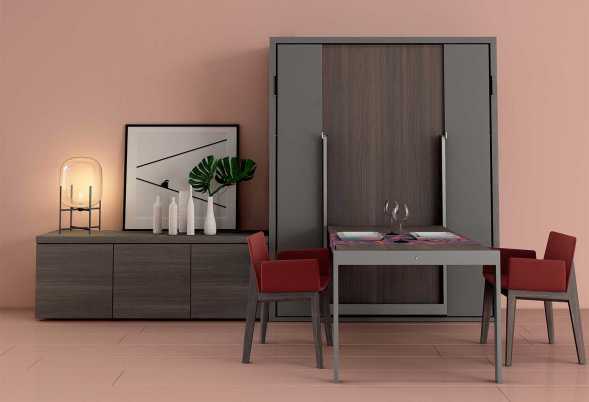 If you need your spare room to be multifunctional, a murphy bed with desk is the right piece for you: it allows for a clever use of the room's space without compromising on style. Not only do they look great thanks to a streamlined design and huge range of colours, they also have handy options and additional storage inside where you can place books and lighting. Don't stop at pictures: murphy beds are customizable. Browse through product pages to find ideas and suggestions, then contact us to find out everything you need to know about our Italian wall beds, prices and configurations. Ima is a murphy bed table combo featuring a pull down double bed and a drop down table. For studio apartments and holiday homes. 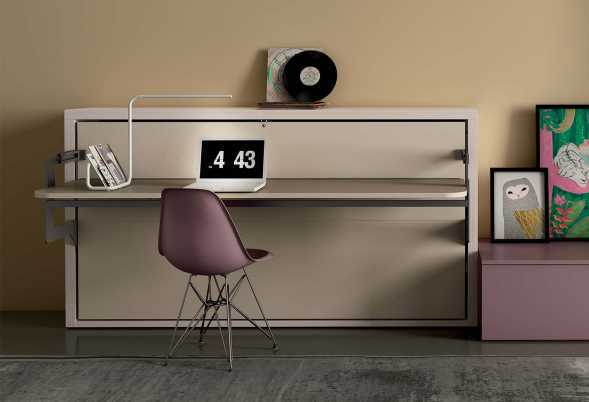 Murphy bed desk combination Miu. Practical multifunctional solution for day an night use, perfect for children and kids rooms. 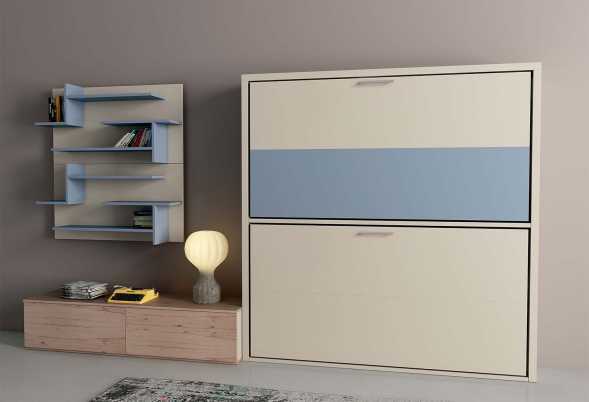 Shin is a murphy wall bed with vertical pull down mechanism. Bed is available in three sizes: single, french double and queen size. Yori and Yori TV single murphy bed with built-in desk. Patented assisted horizontal opening mechanism. Ideal space-saving solution. Nobu is a double murphy bed with sofa. A space saving solutions that brings both the convenience of a queen-size bed and a comfy sofa. 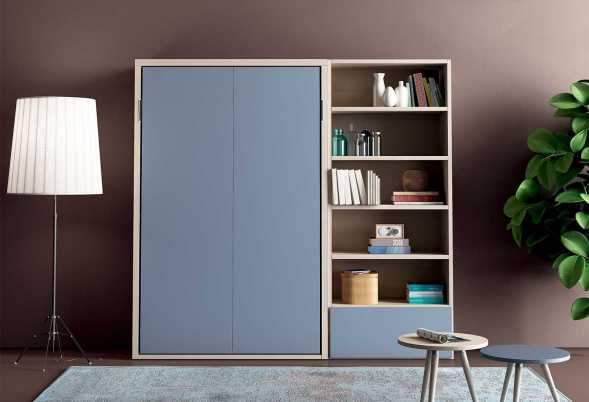 Nikai Wardrobe is a sliding wardrobe with foldaway bed. Storage space equipped with clothes hanger rods and shelf. 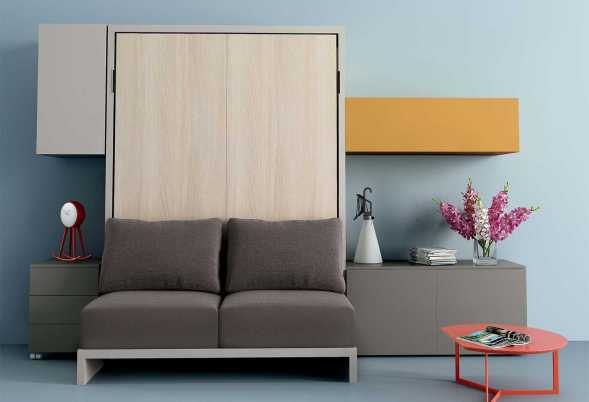 Shin is a foldaway bed with built-in 2-seater sofa. Available as a large single, French or double bed. Several melamine and lacquered colours available. 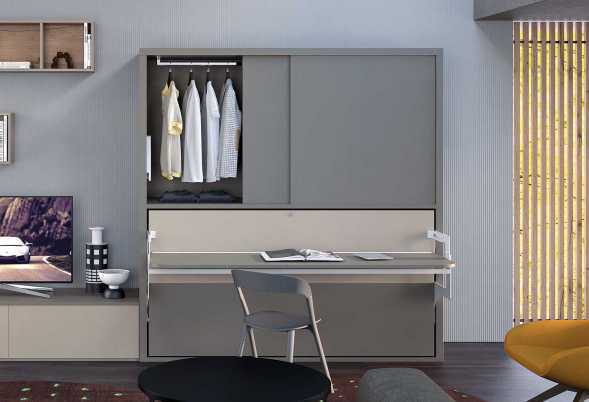 Yori Wardrobe is a single wall bed with wardrobe and built-in desk. Ideal for small houses or one-room flats. Nikai is single horizontal murphy bed with drop down opening. Also available as a large single and for bridge wardrobes. Yori Up is a murphy bunk bed with desk. Other models available: drop down single bed Yori; single bed with shelving system Yori TV. 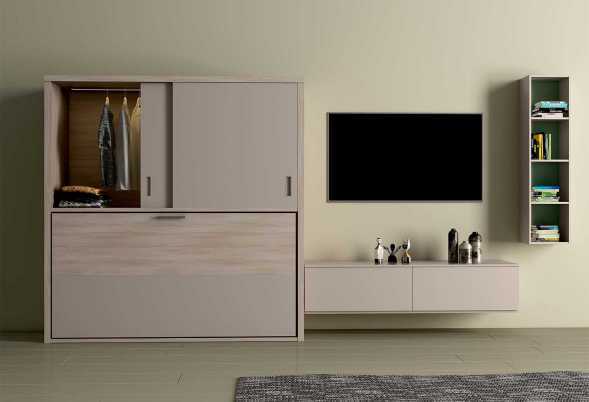 Nikai is a modern murphy bed with TV unit perfect for studio apartments or guest rooms. 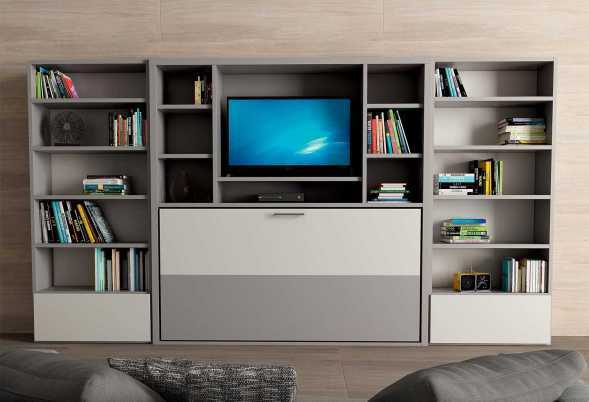 Horizontal opening and built-in bookcase with TV compartment. Nikai is an horizontal pull down bunk bed in lacquer or melamine. It features two 90 x 190 cm beds.